Welcome to the NEW Daytona Beach! The "E-Zone," an abbreviation for Entertainment Zone, is the center of tourism at the "World's Most Famous Beach" with a market over 3.6 million people within a 90-minute drive from all that Daytona Beach offers. 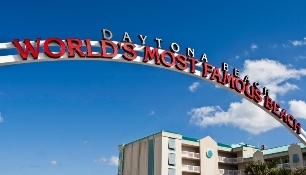 Well-known as the birthplace of NASCAR and host for some of the great sporting events in motorsports, over 8 million visitors return each year for fun in the sun in Daytona Beach. Each year, we offer new surprises including a $20 million upgrade to the historic Daytona Beach Pier, Bandshell and Boardwalk. From Joe's Crab Shack national flagship restaurant to the long-time favorite Ocean Deck restaurant, dining options are endless along the Atlantic Ocean. Spend as long as you like in our wide range of hotel rooms that compliment Florida's largest and newest convention center just a block from the beach. Want more? Spend the evening strolling down the Boardwalk as magicians and other performers entertain you along the arcades and amusement rides, see the latest movie at the Ocean Walk's one-of-a-kind Paragon Theaters or take in a night at the symphony, a Broadway play or your favorite musical venue at Peabody Auditorium or the Bandshell.